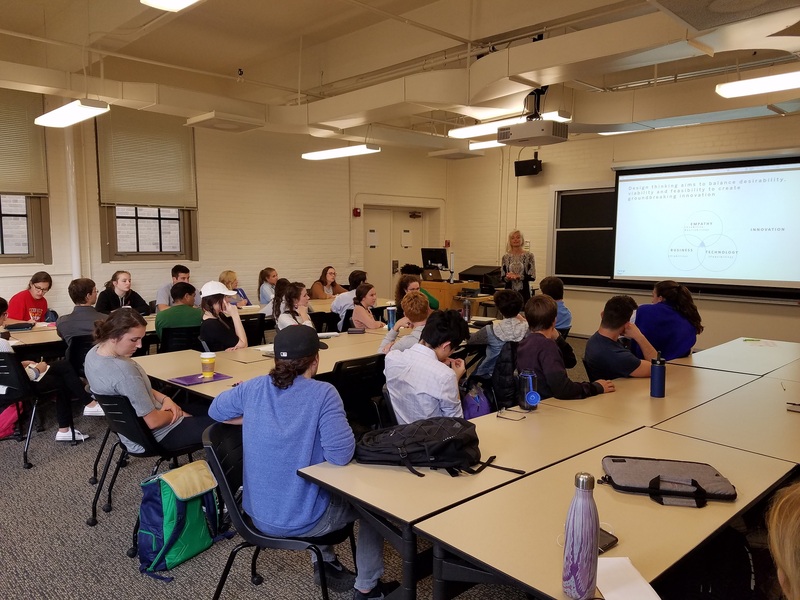 SAP experts served as guest lecturers and project coaches to over 200 Notre Dame students on Tuesday and Wednesday of the past week. Andrea Anderson and Julia Steier joined me on campus to work with students in classroom settings and several informal gatherings. They were on campus primarily to lead a MBA 4 day case study workshop with Design Thinking. I will describe that engagement in further detail in another communication. Each interaction was related to Design Thinking and its principles which are being applied in multiple ways at the university. We had the privilege of visiting six separate classrooms and several special events over the course of two very busy days. Classes spanned the Design department of the College of Arts & Letters, classes regarding innovation and entrepreneurship in the Mendoza College of Business, and a Design for America club meeting. While on campus we were able to advance the strategic Design Thinking conversation at Notre Dame in three separate meetings with the Deans of Engineering, Business and Arts&Letters. Traditionally, design has been used to connote the process by which the physical artifacts of the objects and communications around us come into being. But over the last decade, design has come more and more to describe not only the development of objects but the process by which one shapes the interactions and experiences of people with the systems, services and organizations around us. A deeply human approach to problem solving, design thinking highlights one? S ability to intuitive This course will follow a series of overlapping modules that will introduce the student to the various iterative steps employed in the design thinking process and becoming familiar with the tools and methodologies employed. The course will feature a hybrid seminar format with lectures and case studies followed by hands-on exercises and practical applications of the theories in the form of team projects. At the conclusion of the course, students should be able to articulate the tenants of the design thinking process and apply those methodologies to problems of a variety of disciplines from science and engineering to business and the liberal arts. We were pleased to speak to Social Entrepreneurship and Social Enterprise Consulting course students. The focus of these lectures was on the importance of human centered design and comprehensive user research. The course descriptions are included below. Some of the most dynamic and successful businesses are aspiring to a “double” or “triple bottom line”: profitability, beneficial human impact, and environmental sustainability. This course exposes students to a new and growing trend in leadership, venture creation, product design, and service delivery which uses the basic entrepreneurial template to transform the landscape of both for-profit and not-for-profit ventures. Social Enterprise Consulting melds social and micro entrepreneurial theory, techniques and tools with practical application through service learning. The course provides a practicum experience focused on the creation of marketing, financial and/or operational plans, culminating in a feasibility analysis and/or business plan. The course also covers issues relating to community, regional, and international economic development; business modeling, including on-line business models; domestic and international microfinance and funding, and business law. The course uses the basic entrepreneurial template to transform the landscape of both for-profit and not-for-profit ventures. We had the pleasure of meeting and speaking with Notre Dame students in the New Venture Creation course where I am serving as a coach and mentor to the students as they work with Design Thinking applied to entrepreneurial start up ideas this semester. Alright, so you think you have an idea for a new venture and are looking to explore the path towards launch. This course will give aspiring founders a first-hand experience in building from an idea into a viable business venture, using the proven best practices used by some of the world’s most successful entrepreneurs. We’ll learn the first steps one should take that will lead to a successful launch rather than frustration and failure. In this course you will work as a team to define an idea for serving an emerging or unmet market need, work to create and validate a solution to serve this opportunity, and create a business model to justify the investment of resources necessary to launch the venture. Teams will pitch their progress at regular intervals to seasoned professional entrepreneurs and receive direct feedback on the business model fit and viability of the venture. When you finish the course you’ll better understand the discovery and validation steps that can lead to successful venture launch.